A short stretch of water that is simply stunning in its rugged, essentially undeveloped beauty – defined by bluffs with an outpouring of exposed rock outcrops and stupendous boulders – all while cruising along riffle after frisky riffle, Whitewater Creek in Iowa’s Driftless Area is a little stream with a lot of reward. Gauge note: Not even 24 hours later the gauge reading was 6.5′ high & 1600 cfs, after a rogue rain dumped 3.5″ overnight! This is the minimum recommended level; below this will be Scrape City. Ideally, look for 3.5-4′ on the gauge or in the ballpark of 600 cfs. Time: Put in at 6:30p. Out at 7:45p. Wildlife: Bald eagles, kingfishers, and woodchucks (or, this being Iowa, groundhogs). Sometimes, I think that Wisconsin looks at Iowa the way that the coasts look at the Midwest. Wait, there’s actual natural beauty over there? Like, for real? Isn’t it just corn and barns? To be fair, all we really know of Iowa is the northeast chunk – its share of the entire Driftless Area (and second only to Wisconsin in terms of included square miles, followed by Minnesota and Illinois, respectively). But to be equally fair, this chunk of the state is the exception to the overall rule of flat and farmed. But it’s one hell of an exception! The Driftless Area over the river in Iowa is every bit as gorgeous and geologically endowed as southwestern Wisconsin – or Arkansas, for that matter. It’s an ancient, sacred part of North America that inexplicably was spared the bulldozing of the glaciers of the last Ice Age. 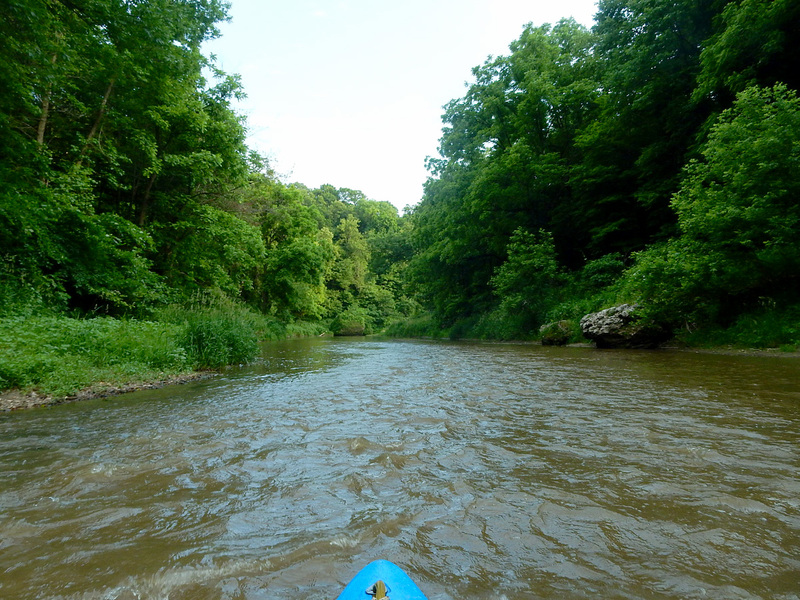 As with the Wisconsin section of the Driftless Area, there are hundreds of miles of various rivers that are tremendously paddleable in northeastern Iowa, some narrow and swift, others broad and slow, but all of them rich in beauty and topographical shock. We are entirely indebted to the commendable Nate Hoogeveen and his excellent guidebook, Paddling Iowa, for putting Whitewater Creek on our radar. Originating humbly southwest of Dubuque, Whitewater Creek is a prominent tributary of the North Fork of the Maquoketa River (itself a prominent tributary of the Maquoketa River, which eventually drains into the mighty Mississippi). Mr Hoogeveen specifically plugs the section of the creek paddled here – from Whitewater Drive to Highway D61. (Note: not D64 as stated in the book.) The latter point is self-evident, as it’s the last bridge over the creek before it empties into the North Fork of the Maquoketa River, less than half a mile downstream. As for the put-in, there are hardly any bridges upstream of Whitewater Drive without adding significant mileage to this trip, to say nothing of the agricultural surroundings and probable shallow nature. But sometimes a 4-mile trip is positively perfect. Especially when it’s 6:30 pm. At first, things begin on a subtle scale: a modest rock exposure and boulder here, a tall eroded sandbank there. But soon enough you’ll find yourself enveloped within a thick forest canopy towered by steep cliffs. In late spring and summer many of the rock outcrops and embedded boulders will be camouflaged by all the lush, leafy foliage, but they’re there. Much more obvious are the ginormous boulders in the streambed, most of them as big as an SUV. Generally speaking, there aren’t too many tight, twisty turns – and hardly any notable obstructions – making this trip quite suitable for newbie paddlers. There are riffles and small rapids galore, however, so some basic boat control and a general ability to read the water to avoid grounding out in too many shallow, is in good order. That said, being a kind of canyon area, the creek here can get hairy in nasty weather conditions, so it’s best to be mindful of recent rain and water level fluctuation. But, honestly, take that with a grain of salt. Consider: we paddled this on a Friday night at a pretty shallow level. Later that same night, the area received 3.5″ inches of rain. The following Saturday morning we paddled a separate trip that began where this trip ended, and while we’d expected the water levels to be much higher, they weren’t whatsoever. The banks at the D61 bridge were exactly as they were before the rain. How does 3.5″ inches of rain overnight not translate to a whole lot more river the next morning? Well, it turns out that it does… but it takes longer than mere intuition would think. By 4:30 pm that Saturday, the creek had risen a foot or more, visibly so; and by Saturday night, the cfs level had quadrupled! Being baseball fans (well, one of us – Timothy), we’re/I’m all for rain delays, but this was ridiculous. Anyhoo, the riffles are at their liveliest at this bend, and the buxom boulders along the shore and embedded in the steep banks are as abundant here as anywhere. Without putting too fine a point on it, this is one of prettiest places to paddle anywhere in Iowa, hands down. And, really, this simply continues for the next mile: more ginormous boulders and steep, wooded bluffs. It’s not until the last half-mile will you come upon a house – and then only briefly. By that point the landscape will become a little more modest and less showy, but the surrounding scenery is still picturesque, the creek’s current still riffly. The take-out also is on the downstream side of the bridge on river-right. From there it’s a short schlep to the road along a not-too-steep incline. There’s a sizeable space along the shoulder at the bridge to park a few vehicles. Expect to see a few on a warm summer day, especially if the water’s up. Honestly, and astonishingly, I don’t think we’ve paddled anywhere with so many ridiculously big boulders. It’s like a kingdom of castles that have crumbled earthward from heaven above. They’re everywhere! Whitewater Creek is a popular paddling stream, and there’s something simply charming about how intact this 4-mile section is. Also charming is that this jewel of geology is surrounded by crops and crops of farmland, hidden in plain sight, there all the while. We’re suckers for bodies of water like this: narrow and intimate, swift flow, and lots of cool, pretty stuff to look at all along the way. I mean, what more can a paddler ask for? On a personal note, when I reached the take-out I was immediately behind two paddlers who’d arrived only a few minutes before me. We chatted and talked a little shop, laughing about taking in some water (their sit-on-tops from above, my leaky boat from below). They noticed that I was paddling solo and still had a bike shuttle to do after paddling. Not only did they offer to give me a ride back to the put-in, but they threw my leaky boat and bike in the back of their pick-up truck, too (meaning one-stop shopping for me without having to return to the take-out bridge). While natives of Iowa, they knew Madison if only on account of regularly attending Great Taste of the Midwest. That offer still stands – if y’all are reading this and in need of a designated driver August 11th! Other than the fickle nature of catching this creek with adequate water levels, nothing. We just loved this trip! It could be longer, ideally, sure. But that’s just not in the cards of reality, and truly, sometimes an hour or two on four miles is just right. We’d definitely do this trip again next time we’re in the area. While we do prefer longer trips, sometimes you have time only for a shorter one. And for all the bang you get out of this buck, this one’s tough to beat! 3 miles – a hill or two, but nothing too crazy. For what it’s worth, while D61 is a paved road, Whitewater Drive is not. The put-in at Whitewater Drive. Pretty darn pretty right off the bat. How do trees do this?!? Riffly along a cool rock wall . Uncommon (for this trip) tall eroded bank. Let the boulder show begin! Despite its name, there’s no whitewater; but it is riffly! Lots of pretty sweeps like this. Despite being surrounded by farms, everything feels wild while on the water. Sunlight infiltrating the boulder-embedded hills. The sheer size of these things is all but incomprehensible. The only real obstruction to negotiate. Out of the canyon now. Generally speaking, locals do a great job keeping the creek clean. Nothing like a last-minute, late-in-the-day gamble totally working out. Love that glean of copper sun on the water. Looks darker than it looked while paddling. The only bridge on this short trip, D61. Low, easy gravel access at the take-out.